The short booklet the Anthrobscene has been translated into Portuguese in Brazil. The essay that was a sort of a single release of the later A Geology of Media now features as part of the Open Access collection Configurações do pós-digital: arte e cultura tecnológicas, edited by​ Pablo Gobira & Tadeus Mucelli. The book’s foreword is written by Lucia Santaella. Recently another Brazilian collection included some of my writing (as well as other translations and texts by Brazilian colleagues) on media archaeology. You can find more information about A(na)rqueologias das Mídias online. With a beautiful yellow cover, Insect Media comes out as a Polish translation: Owady i media! The translation is published by the Krakow based press Księgarnia Akademicka and the “Interpretations” series focusing on cultural studies, performance studies and new historicism. The series has published books such as Hans-Thies Lehmann’s “Postdramatic Theatre”, Erika Fischer-Lichte’s “Transformative Power of Performance”, Judith Butler’s “Antigone’s Claim”, Thierry Bardini’s Junkware and Freddie Rokem’s “Performing History”. A massive thanks to the series editors and the translators professor Małgorzata Sugiera and Dr. Mateusz Borowski for their work on the translation! I wrote a short text for J.R. Carpenter’s just recently published book The Gathering Cloud (Uniformbooks), a book of which engages with the history of meteorology and various archival material about the weather and clouds in hendecasyllabic verse. The Gathering Cloud came out also as web-based work that you can find here but I warmly recommend the book itself too. Do also get in touch if you are interested in reviewing her book. Below my short introductory-kind of a text, published with permission by the press. Every time it rains, media history soaks into our skin. Clouds and their seemingly light ephemeral nature are full of the chemical remnants of the on-going industrial age, what some call the Anthropocene . Human science and technology have penetrated the hard geological substrates of our culture and made the air part of our chemical cultural history. Many prefer too think of the current informational culture as one of light, marked by the weightlessness of fibre optics and the speed of digital transactions, and yet it is also one of weight – of minerals, metals, energy consumption, and entropy. The weather comes and goes but our enthusiasm for it persists. To speak of weather is to articulate a continuum between humans and their environment. It’s what’s high above our heads and what sustains life beneath our feet that should concern us most. A breath of air. We inhale the weather. We exhale it. We measure it, we paint it, we verbalize it, we speak and write poetry about it. J.R. Carpenter’s The Gathering Cloud is both a condensation of media history and a comment on the current environmental weight of clouds. This book reminds us that cloud computing is one of the backbones of contemporary culture. The particularly interesting thing about cloud computing is that it is so heavily about climate control: server farms are carefully managed environments that cater to the well-being of the machines that ignorantly and yet with high-speed accuracy convey the things we talk about online, from #lolcats to emails, from memes to alternative facts. Of course, clouds were technological long before cloud computing. As Carpenter writes, J.M.W. Turner’s painting “Rain, Steam and Speed” (1844) is about the meeting of a new technological world with the air of the planet: the exhaust of steam trains and of the massive factories that define the particular clouds of our climate change era mix with air to create vast fields of waste, both visible and invisible. Clouds are painted, engraved, and increasingly now also computed in weather simulations and forecast models that both the holiday goers and the military are constantly keenly following. Clouds and the weather have been continuously remediated through a history of visual technologies and strategies of representation, and still, as Carpenter points out, they resist a stable ontology. They resist a lot of things: they are made of constant perturbations, micro-movements, dynamic turbulence. This struggle with representation is not just about showing what’s up there but also bringing it back down here as material for analysis: nowadays, clouds are simulated and again, and so return to digital cloud (computing) platforms. Carpenter evokes the Greek history of the four elements (earth, air, fire and water) as part of media and visual history. As such, her project relates to recent work in both contemporary technological art and cultural theory interested in the environment. She draws upon John Durham Peters’ The Marvellous Clouds that starts investigations of media from their elemental existence as nature. As Peters argues, the sky has been for a long period considered as a place of media. Read as signs by Ancient Babylonians, as exhalations by Ancient Greek Philosophers, only in our age of technical media has the sky become the object of another sort of analysis. The sky is where visual media starts, as light filtered through the atmospheric levels. But light is not the only element of interest. The other chemical realities of clouds must also be included in this story. The Gathering Cloud presents a series of material transformations that are made visible through a media history executed as digital collage and print publication, hendecasyllabic verse and critical essay. Carpenter’s methodology as a writer is closely linked to the field of media archaeology (a field interested in artistic, surprising, experimental, and sometimes imaginary ways of understanding contemporary media culture though the past). But it would be as fair to call her work a poetic media meteorology: it shows passionate ways of writing the sky, the digital cloud, and the climate changes that we live in, revealing gaps between our concepts and realities of the environment. And don’t be mistaken by airy the connotations of the word – the cloud is already well deep in our lungs as well as our minds. I am writing some entries (“Anthropocene”, “Medianatures”, “The Earth”) for the forthcoming Posthuman Glossary, edited by Rosi Braidotti and Maria Hlavajova. The project and some of the entries were the topic of seminars during May/June in Utrecht in a row of seminars, and the book I believe is expected to be out later in 2016. Here’s one of the text – although in draft form (and not copy edited); a short text on the Earth. One can say topical for so many reasons: issues of climate change/disaster, as well as the perhaps linked enthusiastic discovery of Earth-like planets outside our solar system – a recurring theme in our current public discourse about space and science. The Earth is a planet, of an age of about 4.54 billion years and defined by its geological formations, density, biosphere, hydrosphere and an atmosphere that sustains life. It’s more than a world for humans but an Earth that is defined by its life-sustaining conditions and its planetary relations (Woodard 2015). On a planetary level, it is one complex dynamic system where biosphere, atmosphere and many of the geological spheres interact; on an extra-planetary level it is as dynamic, part of the gravitational pull, periodic rotation, cosmic rays and the radiation of the sun. Buckminster Fuller coined it “spaceship earth” marking the speculative beginnings of post-planetary design: ‘We are all astronauts’ (Fuller 1969: 14) who spin in space traveling 60 000 miles an hour, in the midst of rich non-human life as well as the intensive relations to other planets and the sun. The Earth is also a complex ecosystem where one should never mistake humans to be the centre of action but merely one part in a larger loop of processes. One way to refer to it is by way of a ‘holarchy arisen from the self-induced synergy of combination, interfacing, and recombination’ (Margulis and Sagan 1995:18). Besides the life of the organic and the inorganic spheres, it is also a mediasphere by which we don’t have to think only of the Jesuit fantasies of the immaterial reality of cognition such as Teilhard de Chardin did–or what cyber culture then rehashed with a dose of Silicon Valley excitement–but the different visualisation systems that give us operational representations of the planet. This is the view of the Earth since the Vostok I-space flight in 1961: the first human that is orbiting the planet and able to describe the ground-detached view. It’s the Earth that features in the cover of the first Whole Earth Catalogue in 1968, and in the inside pages hailing the imagery of the satellite era: the necessary coffee table book of 243 NASA images, in full color, from the Gemini flights in 1965—for only $7. The Earth furnishes the home. Much more than an echo of psychoanalytic stage for the planetary design, the mediated vision turned back on the earth itself was instrumental to a range of political, scientific and military considerations. Seeing the Earth from space was one such thing that had an effect on climate research (also impacted by the nuclear testing, see Edwards 2010). It had an effect on military planning and geopolitical evaluation. It opened up again a holistic view of the planet as one although at the same time as a complex system of non-linear kind. It contributed to a variety of cultural moods and movements. Even the gaze to the otherworldly away from the Earth was a way to sharpen the focus on the planet; But the technological gaze toward deep space with telescopes such as Hubble was never just about space and the interplanetary worlds. Geographical surveys benefited from the developed lenses and image processing of satellite-enabled remote sensing. (Cubitt 1998: 45-49) The perspective back to the Earth has enabled the fine-tuning accuracy of corporate digital maps such as Google Earth and a massive military surveillance system too. The Earth is constantly targeted by satellites and remote sensing systems such as the Planetary Skin institute. The institute is one among many systems that offer polyscalar view of multiciplity of processes for analysis. It boasts with the ideal of reading these as “scalable big data” that benefits communities and can “increase, food, water, and energy security and protect key ecosystems and biodiversity” (quoted in Bishop 2016). Alongside systems as the Hewlett Packard’s Central Nervous System for the Earth (CeNSE) it creates real-time surveillance systems that intend more than mere observation. As Ryan Bishop (ibid.) argues, these are massive level systems for constant data-based interpretation of the various scales of the Earth that indeed define a specific corporate-security angle on a planetary scale. Our relations with the Earth are mediated through technologies and techniques of visualization, sonification, calculation, mapping, prediction, simulation, and so forth: it is primarily through operationalized media that we grasp the Earth as an object of analysis. Even the surface of the earth and geological resources used to be mapped through surveys and field observation. But now this advances through remote sensing technologies (see also Parikka 2015). One can argue that they are in a way extensions of Leibniz’s universal calculus, which offered one way to account for the order of the earth, including its accidents like earthquakes (such as the infamous 1755 in Lisbon). But as the architect-theorist Eyal Weizman argues, this calculation of the Earth is now less organized according to the divine order of Christian Deity and more about the “increasingly complex bureaucracy of calculations that include sensors in the subsoil, terrain, air, and sea, all processed by algorithms and their attendant models.” (Weizman, Davis, Turpin 2013: 64) Also practices of meteorology are to be understood as such cultural techniques and media operations that order the dynamics of the sky as analyzable data. The terrestrial opens up through what circulates above it, the atmosphere becomes a way to understand the ground and the orbit is where the understanding of the Earth begins by way of massive data-driven remote sensing systems. The nomos of the Earth that defines its geopolitics is one that reaches out to the heavenly spheres as much as to the multi-scalar data-intensive operations (see Bratton 2015). Benjamin, W. (2008) ‘To the Planetarium.’ In Walter Benjamin, The Work of Art in the Age of its Technological Reproducibility and Other Writings on Media. Cambridge, MA: Harvard University Press, 58-59. Bishop, R. (2016) ‘Felo de se: The Munus of Remote Sensing’. Boundary2, forthcoming (estimated 2016). Bratton, B. (2015) The Stack. On Software and Sovereignty. Cambridge, MA: The MIT Press. Cubitt, S. (1998) Digital Aesthetics. London: Sage. Edwards, P. (2010) The Vast Machine. Computer Models, Climate Data, and the Politics of Global Warming. Cambridge, MA: The MIT Press. Fuller, B. 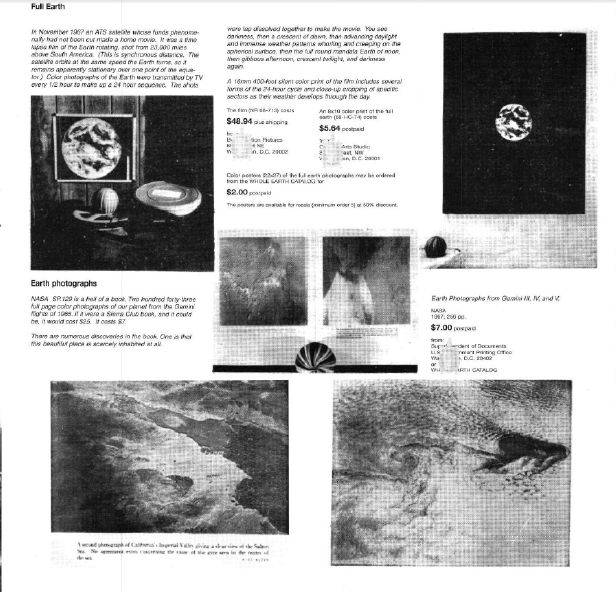 (1969) ‘Operating Manual for Spaceship Earth’ Online at http://designsciencelab.com/resources/OperatingManual_BF.pdf (originally published in 1968). Margulis, L. and Sagan, D. (1995) What is Life? New York: Simon & Schuster. Parikka, J. (2015) A Geology of Media. Minneapolis: University of Minnesota Press. Virilio, P. (1997) Open Sky. Trans. Julie Rose. London: Verso. Weizman, E.; Davis, H. and Turpin, E. (2013), “Matters of Calculation: Eyal Weizman in Conversation with Heather Davis and Etienne Turpin,” in Architecture in the Anthropocene: Encounters among Design, Deep Time, Science, and Philosophy, ed. Etienne Turpin. Ann Arbor, Mich.: Open Humanities Press, 63-82. Woodard, B. (2015) ‘Less World to be Ourselves. A Note on Postapocalyptic Simplification’ E-Flux Supercommunity, August 6, http://supercommunity.e-flux.com/texts/less-world-to-be-ourselves-a-note-on-post-apocalyptic-simplification/.